Eating out occasionally can add up pretty quickly. So we’ve developed the very first premium pass to some of local’s favorite restaurants. Order $10 or more and save $2-$3 off of every bill and as much as $5 off. Try it out for free or join the premium club for $5 a month and unlock over $1,500. of redemptions every month. A couple things right off the bat that are frustrating to me. First of all, I just wanted to check out the app and immediately they ask for your phone number with no explanation why. The app is poor and glitchy and does not run well. I mostly downloaded it to see what the subscription model was and... I still don’t know. You can’t see what it is because it’s behind a credit card input wall. If you are going to run an advertising campaign to college students that familiar with business models like this, the execution should be much better than this. Especially if you are going to advertise at my door step... and use obscenities to advertise to a mostly LDS population. Poor marketing decision. We’re so sorry you had this experience. 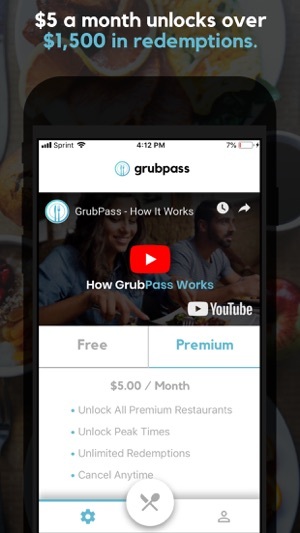 We’d love to apologize over the phone, and offer you a free year of GrubPass. We’d also love to give you a gift card to go enjoy a couple meals on us. Would you please email support@grubpass.com so we can get that all to you? 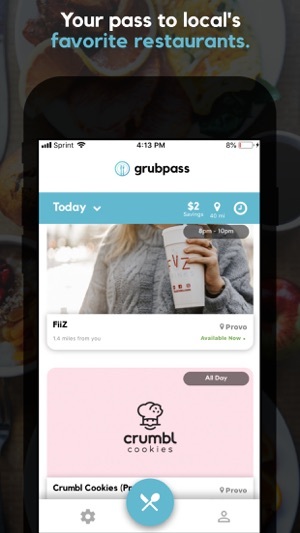 I am really liking grubpass! My husband and I use it for dinner or even a date night treat when we go out. I wish there were more options, but there are always new things coming in so I’m sure they will get all of our favorites eventually! We save money every time and it makes us much more likely to go out! What college student doesn’t like cheap stuff? It is perfect for college students! We are glad you're liking it! Thanks! Being a college student, every dollar counts and grubpass makes it so easy to eat good food for cheap!! I love that I can go to so many amazing restaurants and always GET $5 OFF !!! It’s perfect for date night, dinner with friends, a quick treat, and food on the go! 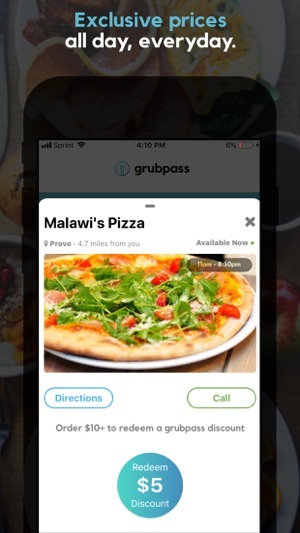 Grubpass makes eating more fun and more affordable! I recommend this app for anyone who loves to eat and save money! I will for sure be using this app again and again!